I posted a video to my Facebook page about being kicked out of a business in my area because I had a service dog and they have a No Pet policy. I tried to educate the manager of the store and let him know that this was against the human rights legislation in Canada and that we had every right to be there. When I realized that he was not going to let us in, (us being my 2 children, my husband and myself) I started the video taping because I wanted to be able to take it to human rights and show them exactly what happened. At first the response was great people supported me in wanting to educate the public about this issue. I was not trying to vilify the company or the employee I wanted to take the opportunity to educate and show the public that things like this happen every day. Most people were amazing and it did help spread some awareness around the issue and start the conversation. Others however took to turning what happened to me and my children into my fault because I did not take into account that this employee was just doing what he was told. I can agree with that to a certain extent; but if my boss told me to do something that I knew was morally wrong you better believe I would say no. At some point in our lives we have control over what we do and say, this employee was not a teenager he was the manager of the store that night. However I do not think that he is a horrible person, nor do I believe that he should be punished in any way. What I do think is that education is the KEY. We can not fix what we do not acknowledge. If it makes you uncomfortable to watch the interaction ask yourself why ? Why does it make you uncomfortable ? How would you feel if you were not allowed where you have the right to be simply because you have a disability ? How would you explain to your kids they can’t enjoy some fun time because their mom is not allowed in because she has a disability ? What we need is for more people to be willing to make some noise stand up for what is right and what is wrong. When you are the one that uses your voice for change not everyone is going to like that; and that is ok, because if you say nothing because you fear what others will say or think, who will stand up for you and your rights? No one ! When you use your voice to help bring about change and break down the stereotypes and misperceptions, it doesn’t matter what the keyboard warriors write because they are not the ones who are fighting for equality every day of their lives. They are not the ones who are being kicked out of businesses for having a disability, they are not the ones who get asked inappropriate questions in public, they are not the ones that are being stared at and talked to like they are 2 because they have a disability. They are the ones who want to make you feel less than and no one can do that to you because your voice will always be louder than their typing. Moving on up !!! Well moving !!! It has been a while!! I hope you are all well. I have been very busy, we have decided to take a leap and move our family from rural Saskatchewan into the city. It has been a huge decision to make the move and one that we have not taken lightly. There was a lot that had to go into this move, is it the best for our kids, our family, me as someone with a disability? There was a lot of questions to be answered. The process of deciding to take this leap took us about a year. Me being blind and wanting to have the most independence that I could is one of the reasons for our move. There is also many other reasons for the move like both my husband and I work in the city so we have been spending a lot of time in the car commuting, and I want to return some of that time to my kids and family. Also I am not able to get to work and events in the evening without my husband waiting around in the city for me or having him drive me in on the weekends. I am someone who prides myself in being super independent and it is a huge priority for me to be as independent as possible. There are many many other reasons for our move but the thing I want to talk about today is the process of moving and buying a house when you are blind. The new house had to check many boxes for me and none of them were to do with paint colour or floooring. The house had to be in a neighborhood that had decent public transit. It had to be close to a elementary school and have access to transit for a high school. There had to be a grocery store in the area that I could access without needing to take a bus ride or cab to get milk. It had to be walkable, it had to have sidewalks and be a really walking friendly neighborhood. The house had to make sense, I don’t like wide open space it complicates things for me. I also wanted a area that had some green space to take Rick my guide dog too and let him have some fun. And I wanted to feel safe, I wanted to feel safe letting my kids live life and play with their friends. Now that we have our move date, there is the other side of it which is now I need to learn the layout of the new house as well as all the routes to the schools, bus, mail box, grocery store, parks, and just learn the area in general. I find this stressful because I don’t like to rely on others. 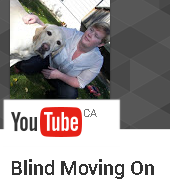 I have already started this process with an orientation and mobility specialist at CNIB. Then I will have to mark my appliances and learn the inside of the house. This is not a downside to moving it is simply my reality. There is more to me moving and it can be a little scary but it will be worth it for sure. The packing has begun and I am not a fan of packing but it needs to be done. And now that I am starting to change our address I realize how many places we have to change our address and holy cow. Moving when you are blind and have three kids 2 dogs, and way too much stuff is going to be an adventure.